Treatment of Dupuytren’s disease using radiation therapy (RT) has been studied and described in the medical literature since the 1950s. RT is now an increasingly common method for treating early-stage active Dupuytren’s and Ledderhose disease. Its availability in Canada is limited, however. For superficial benign conditions such as Dupuytren’s, the amount of radiation given is lower than that for cancer, thereby reducing the risk of side effects. Over the years, many studies have indicated the efficiency of RT in the early stages of the disease and when provided during the nodule phase, before any contraction occurs. In early stages, the window for RT is when nodules are growing and before cords develop. Radiation therapy has not been shown to correct any contraction that has already taken place, but it can slow down or halt disease progression. RT is also effective at treating Ledderhose nodules in the feet. With RT, the nodules and cords associated with Dupuytren’s are irradiated either with X-rays or electrons. This is usually done over two courses of RT each consisting of five daily treatments of 3 gray (Gy), adding up to a total dose of 30 Gy. Although this is the most commonly used protocol, there are others, such as treating the disease with seven doses over two weeks for a total of 21 Gy. The nodules need to be active at the time of treatment. The result can be a softening of the nodules or cords, a slowdown or even a complete halt in the disease’s progression. Beneficial results may take from a few months to a year to become apparent. Not unexpectedly, a therapy that destroys or modifies Dupuytren cells also has an impact on other cells. A typical side effect is dryness of the irradiated skin. As far as we know, this has no further disadvantages and does not cause any pain, though it may be a longer-lasting or permanent effect. There is general concern about cancer resulting from high-dose radiation treatments, but the risk depends on the dose and energy of the radiation, and on which parts of the body are being irradiated. According to some specialists, the increased probability of acquiring cancer from radiation therapy for Dupuytren or Ledderhose diseases is low. There is nothing in the medical literature concerning patients developing cancer in irradiated areas. Patients need to decide for themselves in consultation with their doctors whether they want to take the risk. Until recently, radiation therapy was not generally available or recommended in North America; however, it has been offered in Europe for many years. In Canada, RT was rarely used and then generally as a follow-up to surgery, in which case it can help to prevent a recurrence. In 2010, RT was approved by the National Institute for Health and Clinical Excellence (NICE), the body which approves treatments in the UK. All radiation carries some degree of risk to health, but in this case the risks are relatively small due to the small dose used and the relatively low radiation sensitivity of the hands and feet. In some hospitals in Canada, RT is now offered as a covered service for Dupuytren’s and Ledderhose diseases. Who should be treated by RT? 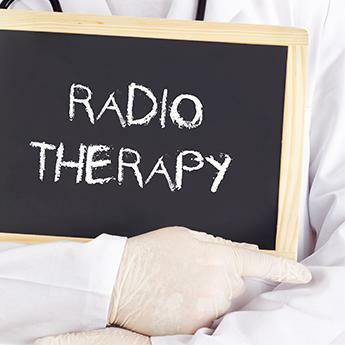 Clear guidelines on who should and should not be treated using radiation therapy are still not available. Treatment with RT probably makes sense for patients with aggressive Dupuytren’s, where RT may slow down or halt disease progression, including patients who otherwise would have to face surgery in the future or repetitive surgically invasive treatments. The challenge lies in the ability to assess the expected progression of the disease as accurately as possible for a particular patient. It is suspected that patients with concomitant associated diseases, who have experienced early onset and who have a family history will have a higher probability of experiencing disease progression and finger contraction. Nevertheless, the extent of this link still needs to be documented. Alternatively, patients with a dormant disease or with a low probability of progression may benefit from a wait‑and‑see approach. If there are no signs of disease progression, then patients should continue to examine and photograph their hands regularly to detect any signs of change. Patients who are concerned about the condition of their hands, be it symptomatic or not, should seek advice from their family doctors. This should normally be the first step in determining the symptom level, natural history and potential treatment options for the patients. Where the disease has asymptomatic nodules, routine follow-ups can be initiated, which could help document disease progression. An active nodule is described not only as a growing nodule, but also as having symptoms such as pain, a burning or itching feeling, or a feeling of pressure or tension. As radiation therapy for Dupuytren’s and Ledderhose disease often also relieves pain, patients suffering from painful disease may also be potential candidates for RT. For patients deemed to be good candidates for RT, there is a limited window to use this treatment before any significant contraction occurs. Radiation therapy works best in the early nodular stages of the disease, when the nodules are active and not dormant. Radiation therapy as a means for treating Dupuytren’s disease is unfortunately not well known yet in the medical profession or widely available in Canada.